Sam Buddelmeyer steps to the side and watches Austin Setty score in the bottom of the second inning for Fairfield on Tuesday after the Peebles catcher allowed a passed ball during Buddelmeyer’s at bat. The Lions battled the Indians at Fairfield High School in Leesburg where the Lions got the best of their SHAC rivals by a score of 10-0. 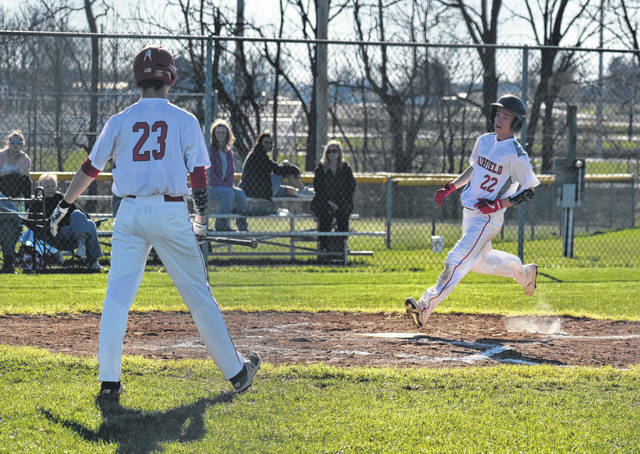 FAIRFIELD — The Fairfield Lions hosted the Peebles Indians on Tuesday in a Southern Hill Athletic Conference varsity baseball game at Fairfield High School and the Lions beat the conference rival Indians 10-0 in five innings. Andrew Dingey got the start and the win for the Lions and recorded 10 strikeouts, allowed three hits, did not issue a base on balls and held the Indians scoreless in five innings. The first batter of the game for the Indians recorded a single and advanced to third base when the Peebles cleanup hitter recorded the second hit of the night for the Indians. But Dingey recorded his third strike out of the game against the five hole hitter to strand the Indians runners at first and third. Fairfield wasted little time and took control of the game with three runs in the bottom of the inning to go up 3-0 after one full inning of play. Jacob Morgan got things started in the two hole for the Lions with a hit in the bottom of the first inning and scored the first run for the Lions on a single by Dingey. Sam Buddelmeyer and Lane Morgan drew consecutive walks in the three and four hole and also scored on the single by Dingey. In the bottom of the second inning Fairfield scored five runs and put the game out of reach early for the Indians with an 8-0 lead after two innings. Leadoff hitter Austin Setty was hit by a pitch in the first at bat of the second inning for the Lions to start a parade of base runners given free passes by the Indians. J. Morgan, Buddelmeyer, L. Morgan and Dingey were either walked or hit by a pitch before the Indians were able to record a single out in the inning and Setty and J. Morgan both scored over that stretch. Griffin Irvin recorded a triple with one out to score Buddelmeyer, L. Morgan and Dingey and provide the final three runs of the inning for the Lions. Buddelmeyer scored in the bottom of the third and Irvin scored in the bottom of the fourth for the Lions to bring the score to 10-0 with four innings in the books and Fairfield need three more outs to end the game. Dingey struck out the first batter he faced, forced a pop out against the second and struck out the final batter of the game against the third batter in the top of the fifth inning to secure the shutout win for Fairfield. The Lions are scheduled to be back in action on Thursday when they host SHAC rivals the West Union Dragons for a league game.